Razzleberry Pie Filling - Canning Homemade! I just couldn't resist having this variation on my site. It came from Terry who presented the Razzleberry Pie Filling in a great picture and I had to find out what combination of berries made up the Razzleberry name. Terry used fresh strawberries, raspberries, blackberries, and blueberries. You could use frozen berries just make sure the thaw them before measuring. These jars look amazing and I am so excited to show off Terry's work! Thanks Terry for letting me share this awesome recipe adaptation! Wash/clean berries. Combine in large pot. Combine sugar, Clear Jel, and cinnamon in large saucepan. Add water, stir using a wire whisk for a better consistency and continue stirring constantly until it bubbles and thickens. You must stir constantly for smooth product! Add lemon juice quickly, and boil for one minute. **Do not decrease amount of lemon juice, this is added for safety. Remove from heat and fold in the berries gently. Fill 7 hot qt jars. Leave 1 1/2 inches head space. Remove air bubbles as you fill by pressing down the filling with your plastic spatula. Wipe the rims with a papertowel and add hot lid and rings. Process in boiling water canner for 30 mins. Remove from canner and put the jars on a towel or rack and leave them for 24 hrs. Next day, remove rings, wash jars, and store! 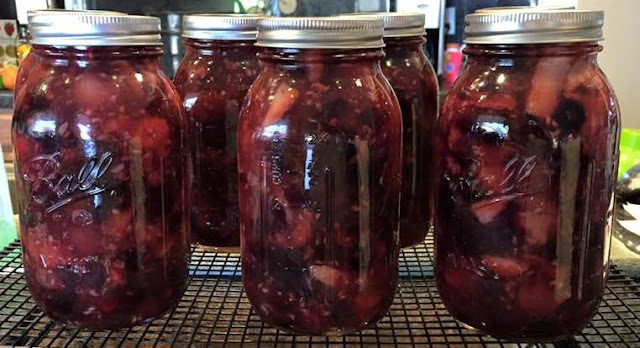 Variation from Terry: Razzleberry Cherry Pie Filling! Add 1 pound of fresh pitted Cherries to the berries! If you need Clear Jel (Gluten Free) you can purchase it from Hoosier Hill Farms!